Should children see an episode of Doctor Who in which a Dalek is tortured? I WAS horrified to read what this episode contained (The Times, May 16). It is time that opinion formers, such as The Times, realise that we cannot allow more and more violence to appear on our screens — from which most children form their view of the world. How long will it be before some child steals a drill from the workshop to frighten another child and maybe goes as far as the Dalek's tormentors? I CANNOT understand why the British Board of Film Classification (BBFC) should refuse an episode a PG certificate because it shows a Dalek being tortured. Over the past 40 years worse things have been shown on the BBC The BBFC censors should get on with more important things, such as warning us off Footballers' Wives. THE Dalek episode may well be unsuitable for those under 12 because of its distressing content, but I do not necessarily agree with the BBFC that it encourages violence as the only solution. My 12-year-old son was heartbroken at the plight of the Dalek and cried buckets. It was not the Doctor's abuse that impressed him but the Doctor's sudden realisation that in doing so he was becoming the thing that he hated, and his decision to act compassionately and rescue Rose, even at the risk of letting the Dalek out In the end it encouraged his compassion towards the "alien and different" and was more likely to influence him towards kindness than otherwise. We saw the first, episode of The Lord of the Rings when he was 8. He was quite happy about the fights and monsters but hid under my arm when the camera angle swooped down from the sky because he was scared of heights. The rating system is useful, but there is no substitute for watching with your child or previewing for yourself. IT APPEARS that in this universe that no resource is unlimited; except for some types of human stupidity. 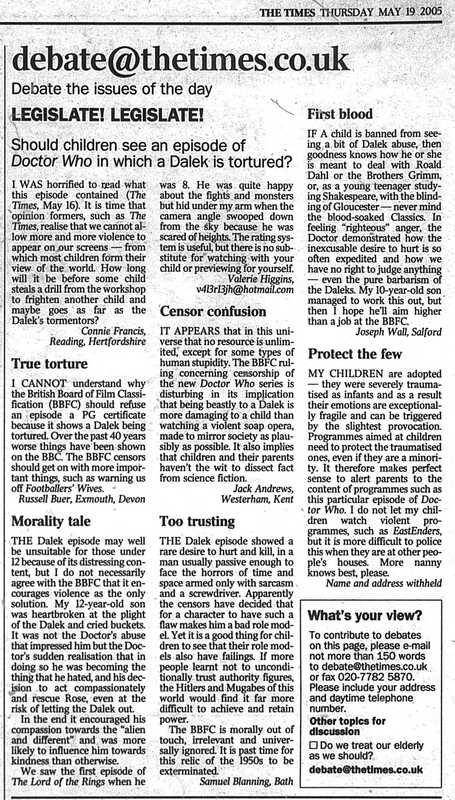 The BBFC ruling concerning censorship of the new Doctor Who series is disturbing in its implication that being beastly to a Dalek is more damaging to a child than watching a violent soap opera, made to mirror society as plausibly as possible. It also implies that children and their parents haven't the wit to dissect fact from science fiction. THE Dalek episode showed a rare desire to hurt and kill, in a man usually passive enough to face the horrors of time and space armed only with sarcasm and a screwdriver. Apparently the censors have decided that for a character to have such a flaw makes him a bad role model. Yet it is a good thing for children to see that their role models also have failings. If more people learnt not to unconditionally trust authority figures, the Hitlers and Mugabes of this world would find it far more difficult to achieve and retain power. The BBFC is morally out of touch, irrelevant and universally ignored. It is past time for this relic of the 1950s to be exterminated. MY CHILDREN are adopted — they were severely traumatised as infants and as a result their emotions are exceptionally fragile and can be triggered by the slightest provocation. Programmes aimed at children need to protect the traumatised ones, even if they are a minority. It therefore makes perfect sense to alert parents to the content of programmes such as this particular episode of Doctor Who. I do not let my children watch violent programmes, such as EastEnders, but it is more difficult to police this when they are at other people's houses. More nanny knows best, please. To contribute to debates on this page, please e-mail not more than 150 words to debate@thetimes.co.uk or fax 020-7782 5870. Please Include your address and daytime telephone number. APA 6th ed. : (2005-05-19). Legislate! Legislate!. The Times p. 68. MLA 7th ed. : "Legislate! Legislate!." The Times [add city] 2005-05-19, 68. Print. Turabian: "Legislate! Legislate!." The Times, 2005-05-19, section, 68 edition. This page was last modified on 26 April 2014, at 22:36.